Confidence is a term often equated to pride and arrogance. Can a Christian be confident and still be a good witness for Christ? Yes they can! But Christians who love and follow Christ do not put their confidence in themselves. They put all of it in Jesus. This isn’t to say that you cannot be confident in your day to day life. You know the things that you excel at and you should feel confident that you will keep excelling at them. You can do great things and still show humility in your lifestyle. Let’s take a look at what the Bible says about confidence. “Stop regarding man in whose nostrils is breath, for of what account is he?” (Isaiah 2:22) This verse, originally spoken by Isaiah to Judah and Jerusalem, cuts right to the heart of the matter. We all must assess daily just how weak our own power and pride is. If you put your confidence in your spouse, they will let you down over and over again (forgetting anniversaries, being late, procrastination). If you put your confidence in your boss, they will let you down many times too (forced overtime, 7 day work weeks, deny your vacation requests). There is not one single person that will not let you down. We all fail each other at some point. “There is no worse screen to block out the Spirit than confidence in our own intelligence.” (John Calvin) You cannot hear the Holy Spirit if you only rely on your own wisdom. By leaning on your own understanding you will block out what God is trying to tell you and teach you. 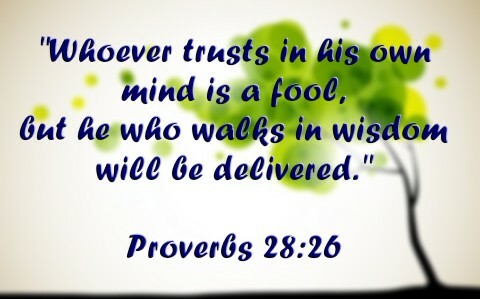 “Whoever trusts in his own mind is a fool, but he who walks in wisdom will be delivered.” (Proverbs 28:26) And true wisdom has its foundation in the fear of the Lord. (Proverbs 1:7) As I stated above, you can have confidence in yourself when you know you are skilled at something. After all God gave us all certain skills and He wants us to use them for His glory. So be confident in your trade, but channel that confidence back to God and thank Him for allowing you to use your skills for His glory. These verses are just a glimpse into why you can have full confidence in God. These verses alone showcase that He will not leave or forsake us, He is with us, He exalts us, He cares for us, He helps us, He sustains us, He strengthens us, and He upholds us. Our God is in love with all of His children and He will continue to allow us to go through trials (sometimes extremely tough and anguishing ones) but He is right there with us through it all. He has ordained every single moment of our lives and we can trust that He is doing something when life is happening. We may not see the end result until we are in glory, but God knows what He is doing. Place all of your confidence in God and He will guide all of your steps one foot at a time. Stay strong in the Lord and be confident in all of His promises. “Blessed is the man who remains steadfast under trial, for when he has stood the test he will receive the crown of life, which God has promised to those who love him.” (James 1:12) May God continue to bless you as you live a life worthy of the calling! The article on being Confident in the Lord is nice, short, and to the point. Thank you for your writing. It is helpful. I am especially grateful that you allow printing of your material.